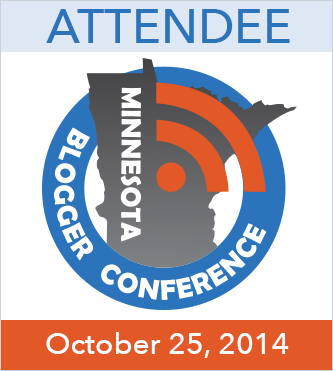 This weekend I will be leaving my comfy, cozy home and venturing to The Big City for the much-anticipated Minnesota Bloggers Conference. This conference is held once a year and was founded by the uber smart Missy Berggren and Arik Hanson. I haven’t missed a year since it’s inception in 2009. To say I wait for this event with baited-breath is an understatement. Tickets are free, are released in “batches” and are typically snapped up in under 30 minutes as soon as they are released. Oh, how I plan for ticket release days! It would be the virtual equivalent of someone camping outside of Best Buy the night before Black Friday. I schedule it, set alarms on my phone, block out that time in my day and have even been known to move appointments so it does not interfere with my Ticket Gettin. Yes, I am hard-core like that. As I sit my with my virtual ticket clutched in my hot little paw, it’s kind of a bittersweet moment. You see, blogging is just not that common in my community and as much as I would love to have a compadre, wingwoman or shotgun rider for this one-day event….there is no one else I know of in a 60 mile radius who is going. SO, as fun as it would be to plot, plan, b.s. and brainstorm for the two-hour drive (plus share gas expense-let’s be honest here) I am flying solo on this one. It’s one of the many times that I feel little like the Lone Rangerette in the Land of Blog. If you have ever felt alone in your blogging aspirations, in any aspiration for that matter, just know that just because there is not someone in your zip code who shares a similar passion, career or even belief, doesn’t mean you are the Lone Blogger on the Hill. The www is filled with amazing resources, groups and forums where you can find like minded-peeps to bounce ideas off of, share projects, crow about victories and commiserate about defeats. Sites like Problogger BlogHER and SITS are dedicated to bringing bloggers together to support each other and Facebook is filled with amazing Groups who work together to build each other up and propel each other forward. Linkedin is another. They’re out there…you just need to look beyond the boundaries of your city or community to find them. Sorry for the delay on responding Sara. I hope we can stay connected as well!